Homo floresiensis : Skull scans suggest that the small-brained Indonesian hominid was a modern human suffering from a developmental disorder. 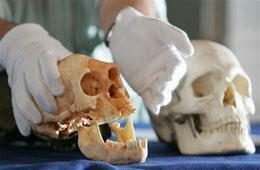 'Hobbit' just a deformed human? Skull scans suggest that the small-brained Indonesian hominid was a modern human suffering from a developmental disorder. Homo floresiensis, dubbed the 'hobbit' of Indonesia, is once again igniting debate. A skull-scanning study supports the idea that the diminutive individual was not a separate species, but simply a stunted human. The study is published today in the Proceedings of the National Academy of Sciences1. But other anthropologists are far from impressed with the analysis, claiming that 'hobbit politics' is yet again clouding the debate. The 18,000-year-old fossil stunned the anthropology community when it was discovered in a limestone cave on the Indonesian island of Flores in 2003. The young adult female lived relatively recently, yet was unlike any other hominid species known — she was only a metre tall, with long limbs relative to her torso and a tiny cranium compared with the modern humans living elsewhere on the planet at the time. She was reported in Nature as a new and completely unexpected species of human: H. floresiensis2. Researchers have since clashed over whether the skull really does represent a different species or merely a deformed Homo sapiens — perhaps the result of dwarfism or microcephaly, a developmental disorder that results in a very small skull and brain. In the latest study, researchers led by anthropologist Ralph Holloway at Columbia University in New York used magnetic resonance imaging to test the microcephaly idea. First, they scanned the cranial spaces of 21 human children suffering from microcephaly and compared them to measurements from 118 unaffected children. The researchers found that two specific measurements — cerebellar protrusion (how far the base of the brain projects backwards) and relative frontal breadth — could be used to discriminate between microcephalics and unaffected children. The team then made similar comparisons between endocasts of skulls of 10 microcephalic humans, 79 unaffected humans, 17 individuals of the human ancestor Homo erectus, 4 individuals from the human ancestor Australopithecus, and the H. floresiensis fossil. They report that the H. floresiensis cranium overlapped most with the measurements collected from microcephalics and Australopithecus. The fossil measurements do not fall within the range for normal modern humans or H. erectus but do fall within the range for microcephalic humans, so Holloway concludes that the fossil could have suffered from microcephaly and is not necessarily a separate species. But other researchers who have studied H. floresiensis are unconvinced by Holloway's analysis. Palaeoanthropologist Peter Brown of the University of New England in Armidale, Australia, who was in the team that originally discovered the fossil, argues that Holloway's study fails to consider the traits that were instrumental to declaring the fossil a new species in the first place. "The proportions of the endocast are completely irrelevant to allocating this fossil to the floresiensis species," he says. "It was the size of the brain relative to the body that was so crucial and that was not even considered here." Meanwhile anthropologist Dean Falk at Florida State University in Tallahassee complains that any measurements made from the H. floresiensis endocast used by Holloway are likely to be distorted by the chips and cracks present in the ancient fossil. She previously conducted computed tomography (CT) scans of the H. floresiensis skull itself and concluded that it was likely to be a separate species3. "We had the opportunity to work with the Homo floresiensis endocast that this team used and passed it by because it was in such poor shape," she says. "We ran a version of this study with CT data that were far more accurate than any data that could be collected from that distorted endocast." Holloway says he disagrees with Brown, and describes Falk's criticism as "ridiculous". "We worked both from endocasts provided by Brown and physical endocasts built from Falk's virtual endocasts," he says. "If there is a problem with our materials there is a problem with everyone's materials." But palaeoanthropologist William Jungers of Stony Brook University in New York isn't convinced by Holloway's conclusions either. "They note a fascinating similarity in the cranial measurements found in Homo floresiensis and Australopithecus but ignored it in favour of making the microcephaly argument," he says. "A weird decision, but hobbit politics as usual." Vannucci R. et al. Proc. Natl Acad. Sci. USA http://dx.doi.org/10.1073/pnas.1105585108 (2011). Brown, P. et al. Nature 431, 1055-1061 (2004). Falk, D. et al. Proc. Natl Acad. Sci. USA 104, 2513-2518 (2007).